Make that three-dee knuckle sandwiches. Because it's really starting to look that way. The handheld isn't even out yet, and two big fighter franchises are already slated for 3DS releases: Super Street Fighter IV: 3D and Dead or Alive: Dimensions. Now, arcade favorite BlazBlue is also heading to the 3DS, as BlazBlue Continuum Shift II will be released on the upcoming portable this spring in Japan. No word on a Western release. 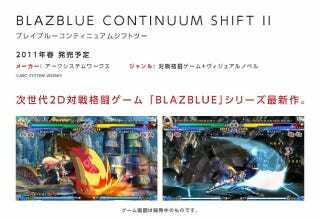 Back in 2008, BlazBlue: Calamity Trigger was released in Japanese arcades, but later ported to home and portable consoles as well as PCs. Check out Kotaku's review of the first Continuum Shift title.